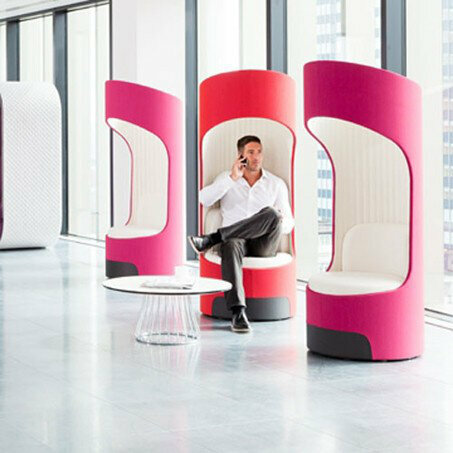 Cega is the ideal product for the modern working environment where personal touchdown spaces and informal meeting areas are the norm. Its aim is to provide a secluded personal space for quiet phone calls, so the user can hear themselves and their other party clearly. Its profile has been intentionally developed to reduce peripheral vision and external noise, whilst the open top structure allows for the correct level of ambient light to pass through the system, whilst the 360 degree swivel as standard allows for enhanced privacy. Shuffle allows for the creation of private, meeting and personal spaces that facilities teams and department managers can rearrange their office from day-to-day, or even from hour-to-hour. It also reduces the element of risk when considering the initial cost for new office space against time motion studies. If an area turns out to be wasted space, the format can change to replicate the more popular areas, rather than remaining unused. Cocoon is based around one simple unit. The product can be used for team meetings, collaborative tasks or a base for the day. It aims to combine the sit and posture from a tradition desk and task seat, with the comfort and feel from a sofa. The high sides, back and roof provide total privacy, shutting off its surrounding environment without the need for interior sub structures. The unit works with a simple 720mm high table with soft corner for easy access. All three of these fantastic products sit perfectly with Working Environments views on high quality innovative design and flexible and productive use of space in work environments.